Even though HTC hopes its next HTC One flagship handset will turn its fortunes around, the company admitted that it needs to focus more on mid-range devices. HTC needs a nice sales boost, and re-focusing on lower-priced devices could do just that. And so, enter the HTC Desire 8. HTC released images of the device via Weibo, a Chinese social network site. While the images above and below show off the Desire 8, famed leaker of all things technology @evleaks revealed the alleged specifications of the device. We are looking at a device powered by a 1.6GHz quad-core Snapdragon 400 processor, which is backed up by 1.5GB of RAM. The screen is of a 5.5-inch 720p SuperLCD2 variety, with a 13-megapixel camera on the back and a 5-megapixel camera on the front. While the Desire 8 has 8GB of internal storage, users can expand the memory via a MicroSD slot. In addition, the handset will allegedly feature Android 4.4.2 KitKat with Sense 6 and BoomSound, which we very much liked on the HTC One. 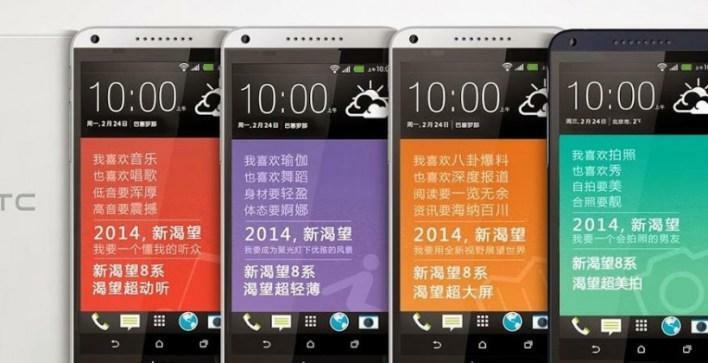 The Desire 8 will also launch in five colors: black, white, red, yellow, and purple. If these specs are legitimate, we are looking at a handset that is a step above current mid-range smartphones, such as the $400 unlocked Moto X. If HTC can keep the price around that price, it could have a winner. With press photos already surfacing, it’s only a matter of time until HTC officially unveils the Desire 8.